April 2019 - SL430R - DH 106 Comet in BOAC livery. April 2019 - MT55P - Boeing 767-AWACS in Japanese Air Defence livery. April 2019 - MT58P - Boeing KC767-Tanker in Japanese Air Defence livery. March 2019 - CLS72-03 - Boeing 737-500 in Braathens livery. January 2019 - SL437P - Mcdonnell Douglas MD90 in SAS livery. September 2018 - SL396R - Full resin Douglas DC-7B - Pan American World Airways livery. March 2018 - SL420R - Resin Saab 2000 in Loganair livery. February 2018 - SL417R - Single kit, triple livery - Shorts Skyvan - Canada Liveries. February 2018 - SL400R - Resin Saab 2000 in Swissair livery. January 2018 - PJW99R - HP Hastings C.Mk.4, RAF dual liveries. January 2018- SL411P - BAC 1-11 523FJ in British Midland Airways livery. January 2018- SL412R - BAC 1-11 523FJ in British Midland Airways livery. January 2018- SL413P - BAC 1-11 510ED BEA Red Square livery. January 2018- SL414R - BAC 1-11 510ED BEA Red Square livery. January 2018 - MT72-15 - Boeing P-8A Poseidon - US Navy Livery. January 2018 - MT72-16 - Boeing P-8A Poseidon - RAAF livery. December 2017 - SL402R - Shorts Skyvan in Hunting livery. December 2017 - SL401R - Dornier 228-100 in Holmstroem Air/Norving liveries. September 2017 - SL393R - Dorner 228-200 in Summit Air livery. July 2017 - SL388R - Hawker Siddley Hs125 700B in Kuwait VIP livery. July 2017 - PJW97R - Handley Page Hastings in RAF C1 and T5 versions. May 2017 - PJW 93P - Avro 780 Andover C1 in RAF Air Support Command Livery. May 2017 - MT52R - Grumman Gulfstream C-37A - USAF. May 2017 - SL383R - Casa 212 Aviocar - Pan Am & TWA dual liveried kit. May 2017 - SL380R - De Havilland DH114 Heron 1 - Sabena. May 2017 - SL382R - Vickers Viking 1B in Maitland Drewery Livery. May 2017 - MT53R - Grumman G550 Shavit Elint, Israeli Air Force. April 2017 - SL378R - Vickers Viking 1B in Eros Livery. April 2017 - PJW92R - BAe HS125 CC3 in RAF (Twin) livery. March 2017 - SL374R - Shorts SC-7 Skyvan in Loganair livery. March 2017 - SL373R - Casa 212 in Evergreen livery. February 2017 - MT72-14 - 1:72nd scale DH COmet 1A in RCAF livery. February 2017 - YO-7R - Armstrong Whitworth Atalanta in Imperial Airways livery. 2017 - MT49R - Douglas DC-8-72 in NASA Military Research livery. 2017 - Y-08R - Shorts C-Class Flying Boat in TBA livery. + 44 (0) 1446 - 710113 | About us | © Copyright of WelshModels 2019. WE HAVE NEW PAYMENT ARRANGEMENTS - see Kit ordering above. 12 April 2019, We have four new and re- releases this week starting with SL430R - DH106 Comet in BOAC livery, PJW100R - DH 106 Comet C-Mk4 in RAFTC & ASC livery, MT55P - Boeing 767 AWACS, Japanese Air Defence livery and finally MT58P - Boeing KC-767 Tanker, Japanese Air Defence livery. See each link for makeup images etc. 14th March 2019, we have two re-releases to appease numerous requests from our moddellers the world over to bring back SL438V the Tupolev TU114 Cleat in Aeroflot, this time still as a vac formed kit but with resin props and undercarriage, also we have bought out in 1:72nd scale CLS72-03, Boeing 737-500 in Braathens livery. Again a vac formed fuselage, but with all other parts resin to complete. 28th February 2019 - Customers are asking us what else is planned by us especially in 1:72nd scale, first off the blocks is a Viscount 800 series, shortly to be followed afterwards by a 700 series, both as possibly accurate as you can get from our extensive research and original manufacturers plans as ever. Following in the wings will be a BAC 1-11 in both 200 and 500 series, a HS748 and finally at the moment a HP Herald 200 series. The Viscount is planned to be all resin including a hollow fuselage as we are using the new resin which is more stable . It will have metal props and undercarriage. We anticipate the Viscount to be here mid 2019 if all goes to plan. 16th February 2019 - New release in 1:144th scale, SL439R - Avro Tudor V dual liveried resin and metal kit. 7th February 2019 - We have finally released CLS72-30, the 1:72nd scale BEA Red Square Vickers Vanguard V951. Like the Air Canada version CLS72-31, it comprises of a vac formed fuselage, metal props and undercarriage, the rest is full resin hence why the cost is a little steep but we have absolutely minimised it for our loyal customers. We will be shipping kits in the exact listing the orders are recieved. The kit has instructions to follow, but offers the modeller a chance to make differing variants of the Vanguard as suits them. 25th January 2019 - Another new release in 1:144th scale SL437P - the Mcdonnell Douglas MD80 in SAS livery. This model was previously released as SL57A many moons ago and has been much requested, so to bring it more up to date we have remodelled all the Pressure Moulded Resin parts which now offer much better detail. January 2019 - Happy New year to everyone, time waits for no-one as the saying goes, but finally those who have waited patiently over a long time have their wish in the form of CLS72-31, The Vickers Vanguard V952 in Air Canada livery finally being released. The BEA red square will be follwing very shortly for which we are taking advanced orders. 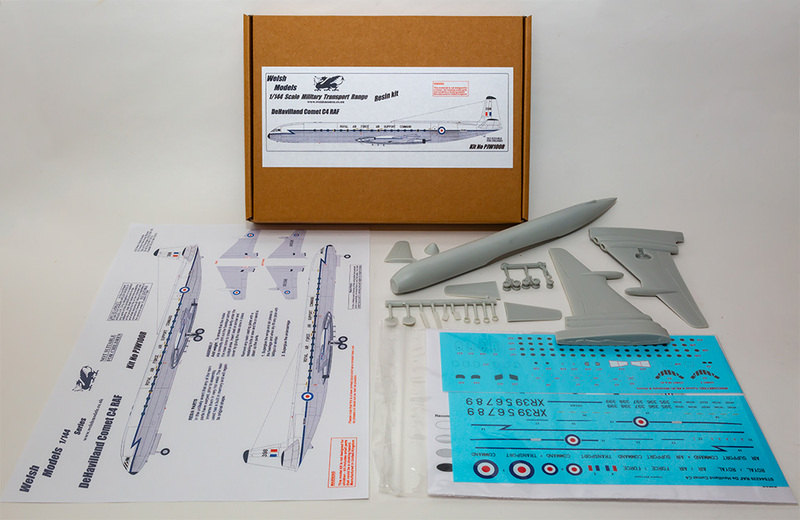 A large scale kit in 1:72nd scale by any stretch of the imagination at over 0.5 mtr long, 0.5 mtr wide and just over 0.85 kg in final packaged weight. With a vac formed fuselage, metal props and undercarriage, the rest is full resin hence why the cost is a little steep but we have absolutely minimised it for our loyal customers. We will be shipping kits this week to those who have pre ordered in the exact listing they were recieved. We hope you enjoy modelling it as much as its been fun making the kit over a lengthy three years. The kit has instructions to follow, but offers the modeller a chance to make variants of the Vanguard as suits them. December 12th 2018 - another new release in the form of MJA72-18 1:72nd scale Airbus A320-111, one of the very first examples with no winglets. This has been release in British Airways ' Sydney 2000' Olympics livery. Full details of makeup on link page. November 5th, 2018 - A new release in 1:144th scale - SL436R - Resin kit of an Embraer EMB145 in Finncomm Airlines Livery. October 7th - New release in 1:144th scale - SL435P - Fokker F100 in Mexicana livery. October 5th - New release in 1:72nd scale - CLS72-32 Boeing 737-2G7 in America West Livery. Vac Formed Fuselage with metal undercarriage and all other parts to complete in resin. September 25th - New release in 1:144th scale, SL 423R Boeing 737-MAX 9 in Lionair livery. This is a full resin kit. September 10th - New release in 1:144th scale; - SL396R - Full resin kit of the Douglas DC-7B in Pan American World Airlines livery. September 2018 - , Three 1:144th scale releases this week in the form of 1) SL434P - Douglas DC-8-63CF in Loftleider Icelandic livery and (2) SL 424P - De Havilland Comet 4 in Dan Air london livery and finally (3) MT57P - Boeing EC-135N (ARIA) USAF 1970's. See links for full details and makeup images. August 2018 - . Three releases this week in the form of 1) SL422P - 1:144th scale Douglas DC-8-73CF in Evergreen International livery and (2) MJA72-17 - 1:72nd scale Boeing 737-800 in United Livery, SL394R - Full resin kit of the Dornier 228 in RAF Royal Falcons livery. Full details on the links and images above. Europe has now decided to alter the way peoples details are stored in relation to the GENERAL DATA PROTECTION REGULATIONS which came into force on ther 25th May 2018. Whilst its good in one respect, the flip side is that we, as a business have to pay rather large charges in order to take credit/debit card details . We either did that and pass on the charges to our custiomers, or , as we now do very little in the way of credit/debit card transactions, we have now decided to move forward as a PAYPAL 'payment' only business. We hope you understand that it was out of our control and with the charges indicated, our kits would have lept in price to cover the costs which we feel is unacceptable to our customers worldwide. ALSO WILL CUSTOMERS PLEASE NOT RING US ON WEEKENDS, we have previously requested this on the ordering page and of late we are getting more and more calls every weekend when we need a little rest like everyone else. Thank you. On the plus side, we have a new release - MT49P - a Douglas DC-8-72 in NASA livery. Its a Vac Formed kit with resin and metal parts to complete. decals are by greg at Drawdecal. Details of the kit makeup are shown above along with side elevation images on the MT49P page. Prices are in the Military Transport series link to the left. Ontop of the previous information we now have all three Boeing 737-8 MAX kits available, SL395 (Westjet), SL416 (Air Canada) and finally SL421 (American). All kits are all resin and images of the makeup kits are shown above. Also on the new releases this week are MJA72-16 -1:72nd scale Airbus A320-214 in Easyjet livery. There are also eight new releases this week, but essentially 4 kits with the option of being Vac Formed/Resin/Metal(P) or Resin/Metal (R) in each kit. SL403P - BAC1-11 518FG in Court Line Yellow, SL404R - BAC1-11 518FG in Court Line Yellow, SL405P - BAC1-11 518FG in Court Line Lilac, SL406R - BAC1-11 518FG in Court Line Lilac, SL407P - BAC1-11 518FG in Court Line Turquoise, SL408R - BAC1-11 518FG in Court Line Turquoise, SL409P - BAC1-11 518FG in Court Line pink, SL410R - BAC1-11 518FG in Court Line Pink, Kit make up shown in the images above, decals by Ray at 2-6 decals including Metallic decals for the silver writing and logo's, SL389P - Boeing 767-200ER in South African Airways livery, All prices shown on the skyliner page, all models available for purchase immediately. SL420R - The Saab 2000 in Loganair livery is available to purchase. We are dispatching our pre-orders on payment, a resin kit with metal 6 bladed props and decals by Cranc, also SL419 R - Fairchild FH227 in Nordair livery. Resin kit with metal props and decals by Cranc. Both kits available to purchase. Were well into March 2018 and have another three 1:144th scale kits on offer in the form of SL395R - Boeing 737-MAX in Air Canada (NEW) livery, SL416R - Boeing 737-MAX in Westjet Livery and finally SL420R - Saab 200 in Loganair livery. Another two releases this week in the form of SL417R - Resin and metal Shorts SC-7 Skyvan in Triple Canadian liveries (one kit, three liveries) - side views and makeup image on the link above. Second release is SL418R - a Triple model Kit and Triple liveries as per SL417R. Prices on Skyliner page along with prices for the new B737 Max and the Curtis C46 - Riddle airways. Another new release earlier this week is - SL400R - Saab 2000 in Swissair livery. Resin kit with metal props. decals by Cranc. New release in 1:144th scale, SL395R a full resin kit of the New Boeing 737-800 MAX in the new Air Canada Livery. Decals by Greg at Drawdecal. The decals should be released to us by UK Customs about the 3rd week of this month for immediate release of the kit - As usual we take advanced orders, no payment is taken until the order is confirmed but this allows you to get your kit in the first 'release' when they are available. 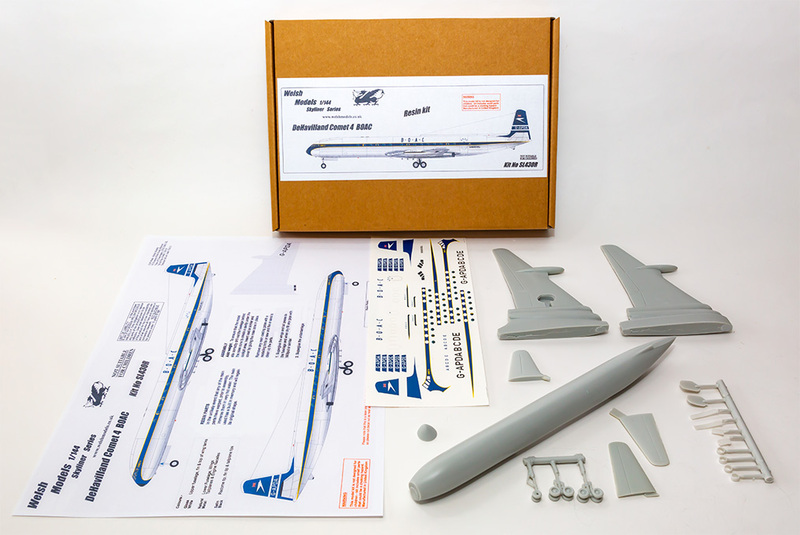 New release in 1:144th scale, SL415P - Curtiss C-46R in Riddle Airways - Vac Formed fuselage with resin and metal parts to complete as shown above. Parts due in this week, advanced orders being taken on usual terms. First of the new 1:144th scale releases in 2018, plus a host of future releases which can be pre-ordered in advance. Firstly, PJW99R - full resin kit of the Handley Page Hastings C.Mk.4 in Dual RAF livery. YO-10R - Resin/Metal kit of a Clark GA-43 in Western Air Express livery, SL411P/ SL412R - Both BAC 1-11 523FJ in British Midland Airways livery, first is Vacformed fuselage, the second is a full resin kit, SL413P / SL414R - BAC 1-11 510ED in BEA red Square livery, Vac Formed and Resin kits. Lastly we have two 1:72nd scale kit of the Boeing P-8A Poseidon....First is MT72-15 in U S Navy livery, the second being MT72-16 in RAAF livery. See relevant sections for prices and details. Probably the last two 1:144th scale releases prior to Christmas in the shape of SL401R - Dornier 228-100 in dual liveries of Holmstroem Air and Norving. SL402R - Short Skyvan with uprated engines and 5 bladed props in Hunting livery. We also have an image of the patterns for the forthcoming and much requested 1:72nd Vanguard which will hopefully be released early in 2018. This is a large kit, almost 21" or 530mm in length which should be available to purchase in early 2018. Another new release in 1:144th scale, PJW95R the Hawker Siddley T1 Dominie in RAF livery. Resin kit with metal undercarriage and nose, with decals by Ray at 26 decals. This week we have four new BAe Jetstream J41 releases in 1:144th scale of SL307R - in the original Manx Airlines scheme, SL397 R - Manx Multi coloured Tail version, SL398 R - British Airways Chatham Docklands livery and finally SL399R - British Airways 'Chelsea Rose' livery. A resin kit with metal props, flapjack fairings and seperate wheel/undercarriage assemblies. (makeup kit as above for all versions). New releases in 1:144th scale SL391R - Hawker Siddley HS-125-3B in Qantas livery together with YO-9R - General Aviation GA43 Clark in Swissair livery. Both are available to order in advance, No monies taken until disptach as normal. Decals for both are by Ray at 2-6 decals. We have another few kits to release shortly, we are just awaiting stock parts to complete the releases. 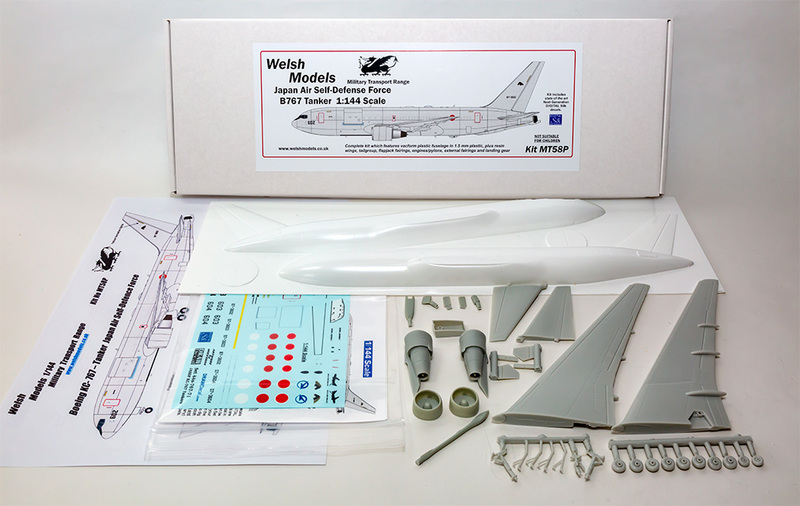 We also have a new Conversion Kit, CV-81 is a conversion kit to convert Minicraft’s KC-135E and Welsh Models KC-135A/Q (MT-1) to a EC-135N ARIA electronic platform Radar version – kit include ARIA large whale shape nose cone, over wing tip aerials, four J57 turbojet engines, four engine pylons, long span tailplanes, dorsal radar dome USAF decal sheets. We had SL396R, our 1:144th scale Douglas DC-7B in resin with metal props to complete, but THIS KIT HAS BEEN TEMPORARILY REMOVED FROM THE CURRENT SALES LISTING as it was pointed out by an eminent source of information on the Douglas DC-7 aircraft that Pan American World Airways infact classified their DC-7C's as DC-7B's and this kit for which we had the plans was infact a DC-7. Needless to say we are working hard to amend the patterns and hope to bring out the correct engined version within the next 4-5 weeks. WE dont often get it wrong as in this case, but we are grateful for the information so that we can bring you a 'correct' aircraft kit as we always try to do. On the very last day of September 2017, we have another new release in the form of SL393R - Dornier 228-200 in Summit Air livery. Resin kit with metal props and undercarriage, decals by Cranc. Details on the skyliner page including pricing. Another much requested release this week in 1:144th scale with SL390P - Boeing 767-223 in American Airlines livery. There have been countless 300 series kits but never a 200 series, which now opens up many options to the kit builder. The fuselage is vac Formed but all the rest of the kit items are Resin. An increadibly detailed decal set offering a 200 and 300 series option by Ray at 2-6 decals completes the kit. We have a number of kits which will be released shortly which we have taken the pattern images prior to resin moulding and their eventual release. SL389P - Boeing 767-200 (GE CF6-80A Engines).South African Airways (current). We then have a number of differing Military Transport versions of the Boeing 767 in MT54P, MT55P and MT56P which will all follow soon. Finally we have an interesting kit in the yesteryear Range, YO9R. those without links are still awaiting imaging, we will arrange this asap. As ever you can always register your interest in reserving any new models prior to their release. No monies are taken until the kits are finally dispatched. New Release for those who model in 1:72nd scale in the form of MT72-14 - a De Havilland Comet 1A in the Royal Canadian Air Force livery. A vac formed fuselage together with all other parts inc detailed cockpit in Resin. Decals by Ray at 2-6 decals. Available to purchase. For 2017, we have a number of All Resin Kit releases planned in 1:144th scale, including a , Boeing EC135N, C-Class Flying Boat, Gulfstream 5 (Shafit), and finally a DC 8-72. In 1:72nd scale we are not far off releasing our 1:72nd scale Vickers Vangaurd. (see links for kit parts that have currently been supplied). We have conversion kits no's CV29 / CV32-CV36, CV39-CV44 available for sale this week after many requests via the formums and e-mails. See conversion kits sections for details and prices. CV34, CV36, CV40, CV41, CV42, CV43, CV44, CV45. 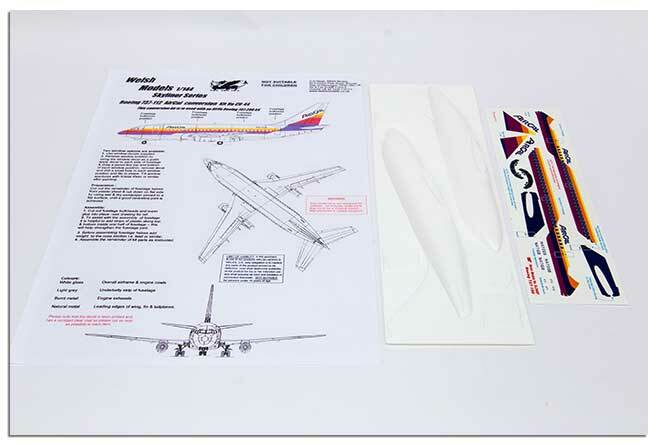 An addition to the Conversion kit series in the form of CV39 - converting Revell, Otaki, Hobbycraft and 26 decals L1011 100/200 series kits to a 500 series, Included is a Vac Formed fuselage, Resin RB211-534 engines and a TAP portugal decal sheet. Make up kit image shortly. We have a very nice image of SL308R our full resinDash 8 Q400 in Eurolot Livery - decals by Cranc' decals, Wales, GB. The image was kindly provided by the modeller, Vince James, Wales, GB. We brought to your attention the latest delivery from Bob Crowe of Proteus Models, of whom we are the World Supplier for the kits. This 1:72nd scale model PM006 depicts the Convair VT-29D of the North Dakota ANG from 1975, USAF, known as the Happy Hooligans. Another excellent offering from Bob with a Vac Formed fuselage, resin cockpit, wings, engines, tail planes and rudder, along with metal props and undercarriage to complete. We have included our first images of a completed kit of CLS72-17 the Boeing 727-100 series in the Lufthansa livery made by Stephen Williams, GB. Many thanks for your efforts Stephen for which we are greatful and give you appropriate credits. Our thanks to Andrew Doppel of Austrailia for modelling one of our CLS72-16 kits and equipping it with TAA livery before photographing it for us. For details on how to be an official distributor of our kits please contact us via e-mail. No commerical entity may use any copyright images of Welshmodels® without firstly obtaining written permission. All images remain the copyright of Welshmodels®. It may also be of note that on Sunday 6th Sept 2015, a Michael Bludworth of Texas, USA made the comment on Civil Model Aircraft's Facebook site " Ouch, I see they used minicraft DC-3 for the aircraft outline". The webmaster for my site responded with the following comment on the site with is authorised by myself.
" It might interest you but Welsh Models bought out their first DC-3 kit long before many other manufacturers. Each pattern is hand built from original drawings only, as has always been the case since inception. 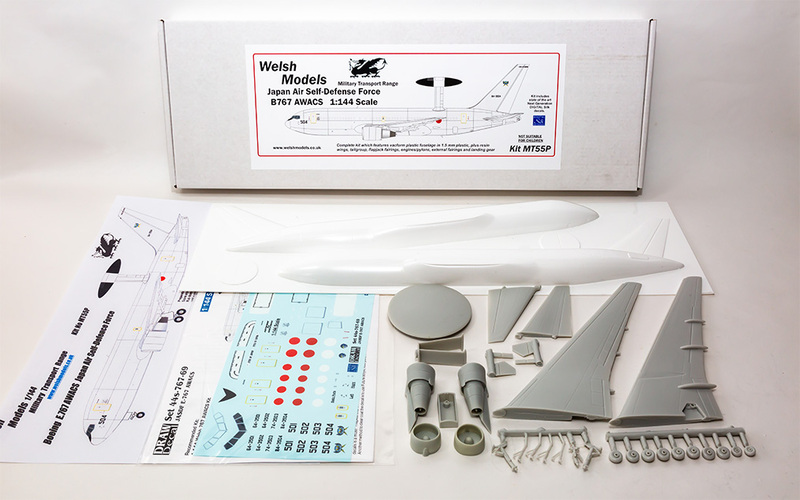 Welshmodels still has each and every original reference data/Plan/pattern/mould of every kit manufactured through their lifetime. Heat Shrinkage, calculated so the models are exact scale when produced is all worked into the original mould dimensions, unlike others over time who have 'quite obviously' copied moulds and then the shrinkage afterwards is greater rendering them smaller in exact scale. Welshmodels have never copied any other manufacturers scale models or drawings. The drawings in this case were copied from the original scale plans provided recently from the USA which has allowed three differing types of model of the DC-3 to be manufactured, and the scale rendering for the image above was then transferred through 'Cranc' decals. Welsh Models pride themselves in always producing 'Original' kits from start to finish and take offence to those who may imply that any part of their kits was copied from another manufacturer. Fact - Welshmodels DC-3 was first produced 18 years ago. Fact - Minicrafts DC-3 was first produced 11 years ago. These facts were further clariifed today by an eminent modelling writer of note who made both respective manufacturers kits on release. " To say this persons comments are uncalled for are an understatement to all the effort put into Welshmodels over the many years Trisha and I have built it to what it is today. Follow us on facebook, click the logo to like our site and recieve weekly updates and links to other interesting sites. We also now take PAYPAL ® for payment. NEW RELEASES in 1:144th scale - SL430P - DH Comet DH106 - BOAC, PJW100R - DH Comet DH106 C-MK 4, RAF Transport Command, MT55P Boeing 767 AWACS - Japanese Air Defence, MT58P - Boeing KC-767 Tanker, Japenese Air Defence.